Every few years Hollywood tries to make the movie musical a thing again. As musicals were the studio’s bread and butter for decades it makes sense that this genre would keep coming back – some would say zombie-like- into prominence. While I love musicals, adaptations of Broadway source material to the screen can be incredibly difficult; entire plots have to change or be excised to respect the new medium, multiple characters that are traditionally played by a single actor (which on stage can lead to all manner of jokes and material) will now be played by different actors due to expanded budget, and- most infuriatingly for purists- the show itself may change tone or message at the whim of the studio who cares little for authorial intent and only care for their bottom line. All of these are the case with Into the Woods, a largely unfilmable show that translates to the screen in a very interesting way. Based primarily on Grim’s Fairy Tales, Into the Woods tells the decidedly un-Disney version of the stories we all grew up with. Through the first half of the movie we witness the stories of Cinderella (Anna Kendrick), Little Red Riding Hood (Lilla Crawford), and Jack and the Beanstalk (Daniel Huttlestone) begin to unfold and intertwine with the original story of a childless Baker and his Wife (James Corden and Emily Blunt) who are given a nefarious quest by an evil Witch (Meryl Streep). The stories play out generally how you remember them: Evil stepfamily (Christine Baranski, Lucy Punch and Tammy Blanchard), Prince (Chris Pine), Big Bad Wolf (Johnny Depp), beleaguered mother (Tracy Ullman) and giants. We even meet Rapunzel (Mackenzie Mauzy) and her prince (Billy Magnussen) along the way. All the while the almost entirely song-based story begins to gain a darker, more menacing edge. At this point the show and film diverge dramatically as the show falls headfirst into the darkly terrifying consequences of the be careful what you wish for message. The film on the other hand gives some characters unexpected happy endings while glossing over the true deadly depths of what the characters are experiencing. That’s not to say it’s not dark, it is, but for a show that had been lauded as being the anti-Disney to be produced BY DISNEY, well…something had to give. The messages and themes of the show remain present in a way but are explored in a far more sanitized and easy to swallow way. What in the show is a second act filled with death, sadness, desperate grabs at triumph, melancholy, and a general sense of “what have we brought down upon ourselves?” is translated to a film as a short “root for the underdog” all too pat ending. And, while I think that this ending worked by and large in the film, it also felt abrupt and somewhat forced. In fact the last 20 minutes of the film feels like a studio note acted out. 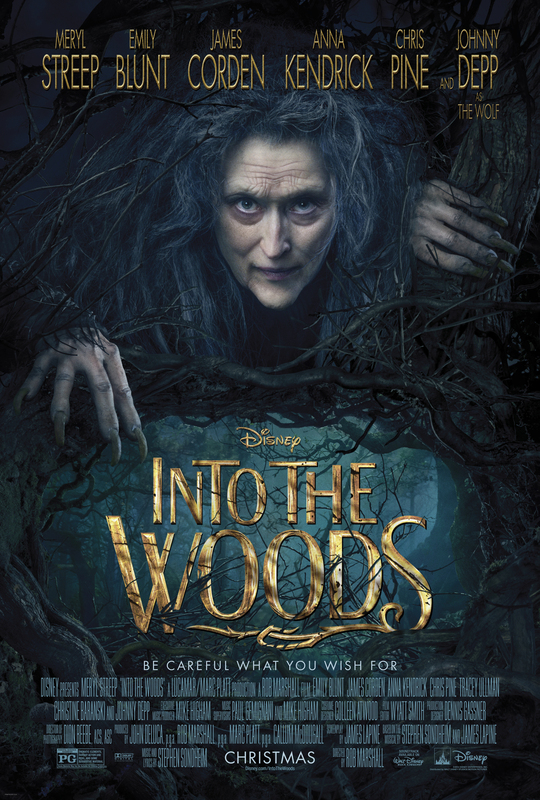 Despite the negative, Into the Woods is still an entertaining movie. Taken solely as its own thing it is fun to watch, charming in parts and very well done. The acting and singing – much of it live on set – are superb and even in the dense, twisty, and increasingly violent story there are several moments of high comedy.